It is widely acknowledged that power is the most important attribute in most sports. Power is a combination of strength (force) and speed (velocity). To maximise your power and get the most out of your training it is important to characterise where your weaknesses lie and this is where Force-Velocity Profiling can help. The FV curve is the inverse relationship between force and velocity. For your own programming, understanding the curve and the influence it has is important when choosing an exercise. Traditional strength and conditioning often focuses too much on force based programs; moving heavy weights at low speeds without paying too much attention to how fast this is being done. The vast majority of sports out there do not actually require maximal force but do require the ability to generate repetitive power output at high velocities. There are certain elements of sports that do require force production at low speeds but these are position specific, e.g. pushing in a rugby scrum is a low velocity high force movement. Whereas sprinting, changing direction, kicking, striking, throwing are all high velocity movements and your ability to reproduce them quickly is generally going to improve your match performance. 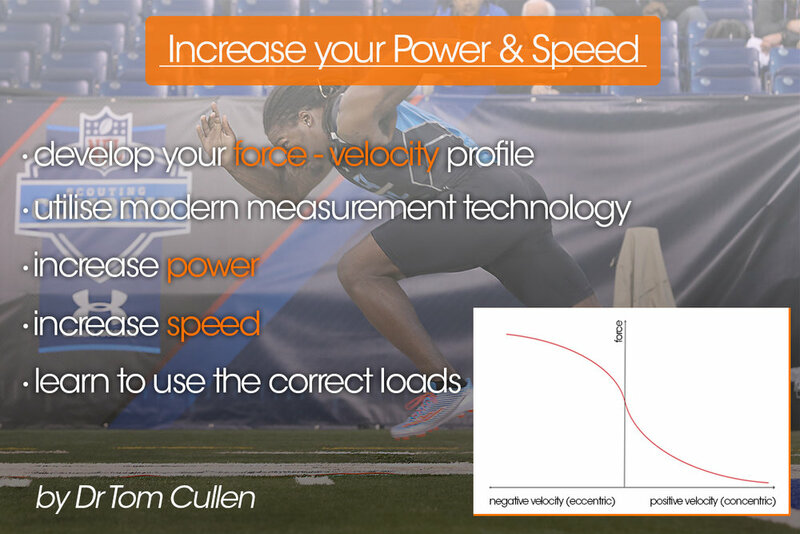 If you are competing in a sport which has any repetitive power components, then building your own force-velocity profile is highly recommended. You can build a FV profile for an individual lift pretty easily; by measuring load and bar velocity. To do this accurately you measure the bar velocity across a range of the loads specific to your 1RM in that movement. For example, you may want to perform tests at 100, 90, 80, 70, 60%1RM all the way down to zero load. Plotted on a graph this should produce a very nice linear relationship which can be compared to an optimal profile (within commercially available smartphone apps) to identify where the athletes could benefit most from training. Whilst this used to require a fully kitted-out laboratory with a force plate, you can now measure this accurately using your smartphone and the latest scientifically validated ‘apps’ such as MyJump. You can also produce a similar profiles for sprinting, jumping and many other activities but it is important to remember the FV profile will be specific to the exercise being performed. More technically complex movements (e.g. single leg hop Vs counter movement jump) may be more difficult to interpret given the increased likelihood of poor or more variable technique. Build your own FV profile and modify your training program. Take advantage of modern tech to help you, My Jump and push bands are two we use at Bounce to help us make the correct choices on loading. bring up feelings and physical changes nobody told you about! There is a lot of mixed information out there about pain in or around the pelvis such as PGP, SPD, SIJ and alignment problems. mentor Jilly told me something that has stuck with me…. Pregnancy isn’t meant to hurt! Although it is common (1 in 5) for women to experience some discomfort during pregnancy it is not normal and it is also very treatable. Have you developed the pregnancy waddle? Are you struggling to turn over in bed? Are you ok for a little bit when you’re up and moving but in agony by the end of the day? Does everything hurt even when you sit still too long? placed on it. This can be carrying a tiny little human for 9 months but it can also be dealing with the awkward and repetitive positions you find yourself in with a new born and growing child. Your body has many ways to adapt to these new demands and allow you to carry on moving without a second thought; however this is usually the result of muscles and your pelvic joints working harder than they are designed for. Over time they will start to let you know when they aren’t happy! So listen to your body when those aches and pains kick in and moderate your activity. or speak to your PT or physiotherapist for advice.  Being active is important but resting is too. friends to help out when needed. in to the car and swivel round to get in with your legs together. a physiotherapist to determine if a belt will help.  Listen to your body! following delivery physiotherapy can help. We always advise you to let your midwife or GP know just to check everything is ok. They will usually refer you to a physiotherapist for an assessment and to help get your pelvis moving well with the strength it needs to support bump and baby after delivery. Prehab is a proactive approach to avoiding pain and injury. It is the ability to build strength and stability around any vulnerable joints or areas of weakness, while improving mobility, balance and joint function to reduce the risk of injury. For most elite level athletes there really is no “off” season, but the brief period of time that they do have to recover from the previous season should be when prehab takes place. Before pre-season training even starts, all athletes should undergo a functional movement assessment to check for any muscle imbalances or asymmetries that could lead to injuries during training or game play. Asymmetries between the right and left sides of the body are fairly common, and are the leading cause of injuries. This baseline assessment will give trainers and coaches the information they need to implement any corrective exercises the athlete may need to perform prior to their sport-specific training. How does this information apply to the sedentary “Average Joe” or amateur athlete? Prehab also helps correct problems created by life outside the gym or playing field. There’s a good chance you spend hours hunched over in front of a computer every day. This lifestyle causes your shoulders to roll forward and tighten. That’s bad enough, but now let’s says that you go out and try to play tennis. Since your shoulders are so tight, they lack the necessary stability and range of motion. Your body has an amazing knack for compensating and using alternative joints and muscles, however, this will ultimately end in overuse injuries and chronic inflammation. It is much easier to prevent an injury than it is to rehab one. Once an injury has occurred, the rate of reoccurrence will increases significantly unless a tailored, clinician-prescribed programme is followed. This is why prehab is starting to play an important role in recovery for surgical patients as well. Studies have found that surgical patients who follow a prehab programme prior to surgery can recover up to 3 times faster than those who do not. For example, strengthening your quads and hamstrings prior to knee surgery will significantly improve not only the surgery, but also the outcome and recovery rates. "I think its my rotator cuff"
"I Think It's My Rotator Cuff"
The above statement has become something of a stock response to shoulder injury or pain. The truth is quite the opposite. With a few exceptions, most shoulder injuries are not the rotator cuff’s fault. It is just a victim. The shoulder’s unique anatomy, which allows the arm to move in multiple directions, contributes to a high incidence of shoulder problems like dislocations, tendonitis, and torn rotator cuffs. The shoulder, like the hip, is a ball and socket joint, which is normally pretty stable since most are comprised of a large “socket” into which the “ball” (end of the bone) fits nicely. The shoulder, however, is made up of a ball larger than its socket to allow for dynamic range of motion. This means all stabilization is left up to the surrounding muscles, ligaments, and tendons, primarily the rotator cuff. What Is The Rotator Cuff Made Of? The rotator cuff consists of four muscles all based around our scapula (or shoulder blade) and attach themselves from the scapula over to the humerus (your arm bone). The muscles are called Subscapularis, Teres minor, Supraspinatus and Infraspinatus. The way in which these 4 muscles attach to the humerus is shaped like a cuff, wrapped around the superior head of the bone. Each muscle has a slightly different role to play in movement; subscapularis for example helps to abduct your arm, raising it over your head. This is the muscle most susceptible to injury for the average gym goer as the muscle runs through a small gap between bones known as the subacromial space. It can become inflamed or irritated if excessive abduction is performed, or if not warmed up effectively, and eventually causing impingement syndrome. Subscapularis muscle is much harder to reach, as it sits between your scapula and your ribs, this means for the therapist to have any palpation they will need to go under your shoulder blade. The primary sport that may affect it is boxing as the subscapularis function is to medially rotate the Humerus, contrasted with the infraspinatus. As a boxer performs most types of punches, the subscapularis will be doing a lot of work. Hitting a tennis ball puts stress on specific joints, muscles, and tendons. Whether you’re serving or hitting a forehand, the mechanics involved in swinging a racquet can cause pain and discomfort. Tennis players need to assess the specific body parts that endure the most stress, and strengthen those muscles accordingly. Most tennis injuries result from overuse. Players continually use the same muscles, and they can eventually breakdown over time through these consistent repetitive forces. The shoulder joint is among the most commonly affected body parts for tennis players. To avoid such injuries, you need to target and strengthen your shoulder muscles making sure that there are no weaknesses or imbalances causing incorrect joint movement. When you’re talking about cuff injuries, in most cases the problem didn’t originate with the cuff itself, but much of late-stage rehab will involve rotator cuff strengthening. If you’re a tennis player, or involved in any other sport that puts a great deal of strain directly on the cuff, then that approach makes some sense. If your shoulder injury was the result of working out and lifting weights, this approach pretty much disregards the true mechanism of injury. Scapular stability and positioning is the common culprit. The muscles around your scapulae, such as trapezius and rhomboids, are enormous in comparison to the small rotator cuff muscles. If these muscles around your scapulae are weak and your scapulae are immobile, no amount of rotator cuff strengthening is going to be able to pick up their slack. Structurally if you imagined putting a tennis ball on the top of a baseball bat, then turning it onto its side, that’s what the shoulder (glenohumeral joint) looks like. It heavily relies on ligaments, muscles and other structures to hold it in place. it's been a little over three and a half years since we officially opened our doors and for those of you who have not been with us from the beginning, you might be surprised to see just how far we've come! Starting with 4000 sq. ft. of gym space and two clinic rooms, four of us shared a vision of changing the way people perceive athletic training by providing what is normally only available to professional sports people to the masses. Since opening, our clinic team has tripled in size and we play host to a wealth of specialist performance trainers. We have introduced a growing members community to our train of thought, now with over 10,000 sq. ft. of elite standard gym space where we also accommodate a number of professional athletes and teams. Back in 2013, we all had aspirations and ideas of what we wanted to achieve and whilst we are not quite there yet, we are so excited that you are all making this journey with us. The big question now is; where do we go from here and what have we got in store to make Bounce even bigger and better? Well, one site is not enough! We are currently searching throughout London for a suitable spot to launch our second Bounce Gym and Injury Clinic - watch this space! Over the past year, we have seen the launch of our Bounce X team events, in which a collection of members and staff have participated in various events, including Tough Mudder, Dragon Boat Racing and Clapham's "Pretty Muddy" where our ladies helped to raise money for Cancer Research UK. In-club, we held our "Million KG Lift Off" in which between members and staff, we managed to lift over one million kg in just 4 hours. In the process, over £1000 was raised for the children's charity, Momentum. More of these events will be happening throughout 2017, so keep your eyes peeled for details! Members and staff take part in the hugely successful Million KG Lift Off - any lift counts! The Bounce Ladies burst through the finish of "Pretty Muddy"
Our list of classes also continues to grow and break the mould of those put on by some of the mainstream health and fitness providers. If you haven't already, visit our Timetable page for a full breakdown of our schedule and available classes. Want something new? We are always happy to looking into other ways of developing our small group training sessions, so please don't hesitate to share your thoughts and ideas with us. Our list of affiliated schools, teams, clubs and athletes also continues to grow. We are proud to put our name to the UFCs fifth ranked light-heavyweight Jimi Manuwa, who has not only climbed up the rankings but also won the Fight of the Night accolade by knocking out Ovince Saint-Preux back in October. AFC Wimbledon's youth team are also flying high in the league with many regularly receiving call up's to the U23 Development Squad. GB Judoka Adam Hoshal most recently won bronze at the BJA Senior National Championship, not to mention the continuing success of Wimbledon Rugby Club on the back of two promotions in three seasons. We also have athletes competing on the international stage in lacrosse, netball, athletics, tae kwon do and triathlon, all training in-house. In addition to individual athletes, Harlequins Rugby Club have utilised our Injury Clinic with our Head of Clinic and chiropractor, Andy Beckinsale, an official consultant for the club. If you play for a team, or are training for anything specific, let us know and we'll be more than happy to help! As many of your have seen from our social media pages, we've recently started an "Athlete of the Week" mini-blog. This is to showcase the talents as mentioned above but to also give our members a chance to get to know our athletes more personally. With that theme in mind, the staff here at Bounce recognise the impressive and undeniable effort that our members put into their training. As a result, we have decided to name a "Member of the Year". This decision was not made easily and we again would like to acknowledge everybody's efforts and encourage you all to keep up your hard work. We will be announcing this over our social media channels, so be sure to stay tuned! You may have seen this phrase popping up around the gym and through some of our social media posts. It is not by accident! A huge part of how we practice is through the inclusion and integration of clinical knowledge and practice into performance training. Both members and non-members alike have some of the most experienced practitioners readily available at their fingertips. If you are carrying long-term niggles, in acute pain, pre or post operation or simply want help training around injuries, our clinical staff are always here to help get you back on track. Visit our Injury Clinic page for more information about our team and the services they provide. We want your feedback! One of our main priorities is that everybody's individual experience of Bounce is a great one. We constantly strive to be better and aim to provide you with a service that is better than the rest. A recent addition to the gym floor is that of a comment box. We welcome your feedback, requests and suggestions of how we can continue to grow and improve. Not only do we encourage our members and our clients to ask for our expert advice but we make an active effort to utilise the vast array of skills we share among our staff. Why use just one professional when you have so many at your disposal? As if all of that isn't enough, we are now extending our services beyond the doors of Bounce. We've been working hard to find other ways to help you not only achieve your training and performance goals but also feel more like a professional athlete too. As a member of Bounce, you will now receive 10% off personalised meal plans provided by Fresh Fitness Food when you use our unique discount code BOUNCE10. Tailored to your goals and freshly prepared before being delivered directly to your door! In-club, we have a partnership with Kinetica to help you make the most of your hard work with pre and post workout supplements. Now that you're eating and training like a professional, why not look like one too? Ladies, we've partnered up with Sweaty Betty in Wimbledon Village to help you not only perform better but look great while doing so. For the students among us; double up for 20% off! Guys, don't worry we've got you covered too. Visit the Prince store, also in the village, for all your gym kit and racquet needs - whether its for restringing, new court shoes or just some fresh tee's, we've agreed 10% off for you! Okay, so we all have a life outside of the gym. Never fear, we've got you covered on the social front too. Hemingway's Lounge Bar in Wimbledon Village, Jacks of London in Wimbledon Town Centre and Park Vintners in Wimbledon Park will now be offering 10% off exclusively to Bounce members. We will soon be handing out key fobs that you can present at these outlets and make receiving your discounts even easier! As we mentioned earlier, our expert clinic team has tripled in size and as a member you will receive 50% off your first appointment. Regardless of your injury our team comprising of physiotherapists, osteopaths, chiropractors and sports massage therapists will be able to help. We know how hard it can be to get motivated after the winter break, so why not bring a friend to train with you and start the New Year off the way you want to continue it? If you successfully refer a friend, you can receive one month of membership for free. From all of us here at Bouce, we would like to extend our thanks and gratitude to all of you like-minded people for joining us on this exceptional journey. It's been an amazing start to what will hopefully be an even bigger and better story. We look forward to seeing you all soon and wish everybody the very best for 2017! Tom is a senior lecturer in Sports Science at the University of Worcester and Head of Performance at Bounce. In the past Tom has worked in professional rugby, professional football and with elite athletes in many endurance sports. “In the strength and conditioning field, skill development is the hot topic right now. Strength and power have and always will be vital aspects of performance, although skill development is of equal if not more importance. Typically, young athletes focus on being the biggest and strongest. However, if we look at the most successful and consistent international teams it is evident that size and strength are not always the best route to success or maintaining a less injury-prone squad. This is true of many sport. For example, many English rugby teams are accused of focusing too much on developing strength and size with their athletes and not enough on skill development. On the international stage we regularly see some of the smaller, albeit most skilled athletes seemingly punching above their bodyweight and out-performing larger opposition. Take rugby players Ben Smith (New Zealand), Brian O’Driscoll (Ireland) or Johnny Wilkinson (England) for example; three of the best players in the world of recent years but relatively small considering modern day standards. Yet during play they appear more powerful than their size would suggest them capable of. Having superior fundamental skill development than other players allows them to skip out of tackles and tackle above their bodyweight. Have you ever questioned why some players, although smaller than their opposite number, seem to do this week in week out? This is where skill development comes in. At Bounce we teach a system that incorporates fundamental movement skills alongside strength training. In the past this has been woefully overlooked by many professional setups but it’s a hugely important area for aspiring athletes. Specific movements transferrable across nearly every sport are often taught incorrectly at a young age (sprinting, jumping, rotating, cutting, changing direction, acceleration and decelerating all fall into this category). It is very common to see athletes even at a professional level performing these movements inefficiently and with poor technique. Should these individuals spend more time practicing and enhancing their basic movement skills, their on-field performance could be so much better and also improve their chances of remaining injury-free. At a time where injury rates in contacts sports are at an all-time high this is obviously important. Every so often a player comes along who has strength, size, power and an amazing level of skill development. Think Jonah Lomu or Sonny Bill Williams. At Bounce we are lucky to have some of the best strength and conditioning staff around to teach the athletes of tomorrow. Open gym on Saturday 24th to lift One million kgs to raise money for momentum. Bring your friends and help make this happen..
"In a quiet back street of Wimbledon Park, hidden behind a small office block is a team of specialist trainers running a cutting edge personal and team-training facility called Bounce. The personal trainers who started this venture are all former professional athletes, and started Bounce in 2013 focusing on adults. They have trained members of the Harlequins RFC, The England Rugby Team, Fulham FC and Wimbledon RFC, triathletes, runners, cyclists and countless mums and dads. When former rugby player and the Head of Sport at Kew House School, Marc Sweeney became involved with the Bounce team, they decided it would be great to offer their elite training programme to young athletes – so they recently launched the Bounce Academy for 11-16 year olds." ‘There is nothing like this around to help enhance the performance of young athletes with potential,’ explains Phil Chesters, a Bounce trainer and professional rugby player with the Ealing Trailfinders. I was invited to Bounce to have a firsthand look at the sports programme in action. A group of young athletes were participating in a four-day performance camp. ‘Our big focus is getting technique and posture correct, then we move onto acceleration. The Academy is based on the EXOS programme, which is an American programme focusing on technique, movement skills, core strength and acceleration. The German Football team uses EXOS coaches for conditioning,’ Marc tells me. Marc and Phil are trained EXOS coaches and Bounce is the only sports facility in south west London offering young athletes this form of specialist coaching. As we watch the children at the academy repeatedly practicing and perfecting sprint starts and acceleration, Marc tells me that each child is tested at the start of the camp, monitored and tested at the end, and presented with a detailed assessment showing exactly where they improved and by how much. ‘Children are not taught to run properly – not at home, not at school. We teach the correct technique, movement patterns, acceleration and multidirectional speed. It not only improves performance and speed but learning the correct technique prevents injury and prolongs a sports person’s career. Both Phil and I were saying earlier that we wished we had access to training like this from a young age. There is no doubt our careers would have been bigger and longer,’ Marc says. Not surprisingly, the interest in the Bounce Academy has been huge. The Wimbledon College first rugby team and students from the Fulham Academy recently went through the programme. ‘We would like to reach all of the local schools who have students with sporting ability in any sport from rugby to football, tennis and hockey, running and cycling,’ informs Marc. Bounce Performance Academy camps run in school holidays, and the team has also launched a scholarship scheme, which allows two students to attend the camp for free. This specialist coaching is allowing promising young athletes to considerably improve their performance. Bounce participants learn training methods and have expert guidance to enable them to progress. It is great to see that young athletes with potential now have access to a training programme ordinarily only offered to elite athletes performing at the highest levels. On Saturday 18th April we officially announced the opening of our new members gym.